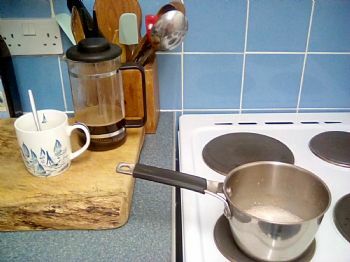 I was doing so well this morning - I had a pan on the stove with coconut milk and cinnamon - all whisked up to a lovely foam ready to pour onto my coffee. 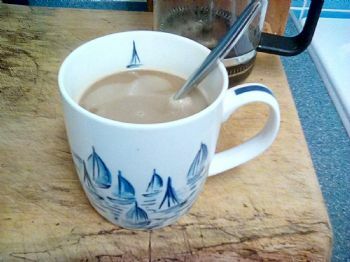 A real home-made special cinnamon coffee. 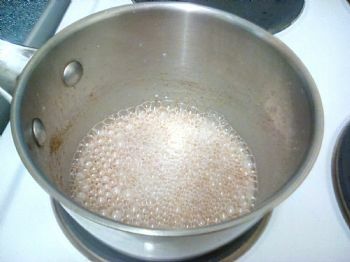 But when I whisked it again, before pouring it, they all disappeared. I was so disappointed! Oh well, the coffee still tasted good. I was very inspired by Spark Guy's latest blog, and decided to set myself up a streak to have chocolate-free days. I thought I could just set up a streak........... but I couldn't see how to add my own streak. So I found the Goal Feats challenge, and set it up there. So now I have a #goalfeats daily check-in, where I can tick whether or not I reached my goal of having a chocolate-free day. Today I went for a coffee in a cafe that had 'vegan brownies' on the counter............... oooh. I didn't. I just had the coffee. And I left my mini-macaroon on the saucer. But you know what? I'm going to go back again on Saturday morning (which I've just realised is only tomorrow!) and have coffee AND the brownie. It's the weekend, and I'm 'allowed'. Some people were curious about my vision board - so I took a snap of it. My photo is not very sharp. I love the coffee pictures you have posted on your Spark Page, but making those designs takes a lot of talent IMHO. Kudos for trying to make foam for your coffee. And Kudos for resisting that chocolate today. BTW, I agree with you about how hard it is to set up your own streak - they could use some improvement in that tech area of some kind of instruction for us at least as I am not very computer literate. My vision board isn't' 'finished' - but I decided to put it up on the wall anyway - it's certainly already working! I need to add more to it. 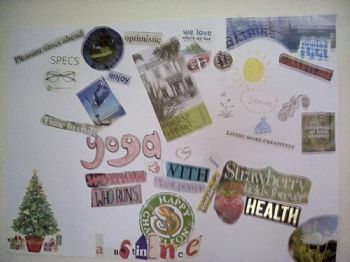 Vision boards work because they fix ideas in your mind - like being continually exposed to adverts! I am glad that you listed what is on your vision board. I tried to enlarge the pictures yesterday, but they blurred when I did. I like that you are allowing the brownie tomorrow. Savor it. I think that planning to have and enjoy the brownie,is a positive thing. It’s then your choice, rather than just impulse, that often leads to regret. It's just one day, but it's exercising control. Chocolate is a treat and you are in control of treats. Enjoy. I love your vision board, it's very inspiring. Have a wonderful weekend with moderation.